The Situation Report has picked up strong signals from our network of Middle East listening posts that the same drones many of us are buying online and flying around local parks are now being outfitted with improvised explosive devices and other weapons by the Islamic State and other terrorist groups. The use of drones for military purposes dates back to Desert Storm in 1991. Since then, unmanned aerial systems, as they are known officially, have revolutionized our military’s ability to carry out direct strikes around the world and to conduct long-term surveillance and reconnaissance. But since IS posted a video in January detailing the results of its research and development into weaponized consumer drones, the terrorist drone threat has taken off. Drones first became a major concern of the Department of Homeland Security and Secret Service in 2015 when several drone flights were detected near the White House, including one that crashed on the White House lawn. But by 2016, military and intelligence officials began to witness cheap, consumer-grade drones being outfitted with explosive devices throughout Iraq, Syria, and Afghanistan. “ISIS, for example, is fitting them with explosive charges and turning them into guided missiles,” the MEMRI report states. “ISIS is using drones to drop small bombs onto Iraqi security forces and civilians. Hizbullah [Hezbollah] too has learned how to weaponize surveillance drones, and the two groups are now using them against each other in Syria,” the report states, quoting U.S. military officials. In 2012, Iran claimed to have captured a Boeing Insitu ScanEagle drone that had violated its airspace. Since then, Iranian officials have unveiled a copycat drone based on claims they were able to reverse-engineer the system. Israeli authorities detected a drone similar to the Iranian copycat in 2016 as it entered Israeli airspace from Syria. An Israeli attempt to intercept the drone using U.S. Patriot Missiles failed. Officials say the alleged Hezbollah drone exhibited “atypical maneuverability,” possibly because of Iran’s ability to reverse-engineer the electronics on the captured U.S. ScanEagle. “As jihadis began using drones, they also began to share technology with each other–including technology they obtained from U.S. drones,” write MEMRI analysts Steven Stalinsky and R. Sosnow. France has had its own concerns with drones, especially after a couple buzzed the presidential palace and a military facility last year. While U.S. authorities are busy funding costly research and development on high-tech systems designed to zap drones out of the sky or intercept their command and control signals, the French military has opted for a low-tech, yet almost foolproof solution—golden eagles. That’s right, France is training four golden eagles to intercept drones. The so-called four Musketeers—d’Artagnan, Athos, Porthos, and Aramis—were born to do this job. Literally, officials hatched these chicks in November atop drones and kept them there during their formative development period. Today, demonstrations have shown d’Artagnan swooping down from his perch at 10 meters per second, slamming into a flying drone, grasping it in his talons, and wrestling it down to the ground. 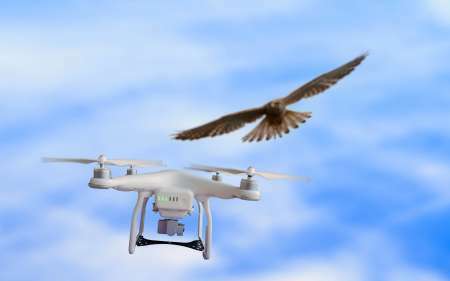 The eagles are so powerful and precise, and demonstrate such a natural hostility to drones, that media outlets in France report that the military has already ordered another brood of chicks. It’s hard to argue with France’s decision considering the 80 million years of predatory evolution that eagles bring to the table. Meanwhile, French R&D has focused on anti-blast protective materials to protect the eagles during their midair interceptions.